Sometimes it is the lesser known Tudor locations that are the most fascinating. When we read about them, it is like opening a whole new box of goodies! What will we find there? What new Tudor intrigue will we unearth? What events might we finally be able to place within the context of a richer and more vivid backdrop? Well, Tickenhill House (sometimes referred to as ‘palace’ and, occasionally, as ‘Bewdley Manor’) in Worcestershire ticks all these boxes. You may have heard of it in relation to ‘The Council of the Marches’, or as the place where Arthur Tudor was betrothed to the young Katherine of Aragon in 1499, or maybe even just from last week’s blog as one of the residences of Princess Mary during her sojourn to the west country as titular head of the Council in 1525-7. My pulse rate quickened when Tickenhill House caught my eye; the place where Arthur Tudor was bound to Katherine? It was a major Tudor event! I needed to know more. If you want to revisit Tickenhill with me, and watch the centuries melt away then, pack your bags and let’s go exploring! If there is one job in the sixteenth century that I would covet more than any other, it would be that of John Leland, antiquary, who travelled around Tudor England in the 1530-40s, making notes on all the places and buildings he passed along the way. We are lucky to have quite a detailed account of Beaulieu, the original (and French) name for the town of ‘Bewdley’, sited on the border between the counties of Shropshire and Worcestershire; here Tickenhill House sat majestically on a raised hill, looking down over the town. Bewdley, (as I shall call it from now on), fascinatingly, has been called the last medieval ‘new town’. Leland attests to this in two ways. Firstly, he states that the old parish church was sited some way from the new town. He concludes that ‘when a bridge was built across the [River] Severn…the concourse of people using it, and the appeal of such a convenient site, encouraged settlers to live there’. Therefore, people moved away from the original, ‘poor hamlet’, and so, the new town of Bewdley grew up adjacent to the bridge. As you might suspect, the bridge was key to the growing town; Leland reports that there ‘was no other bridge below this until Worcester’, which was around 15 miles away. So, it was a vital crossing point. Amazingly, he also tells us how he was able to verify the age of the town by asking a local merchant, who, ‘confirmed that it was in fact new, adding that its charter had been granted by King Edward [IV]’. I can just see him in a tavern, resting his weary bones after exploring the town, enjoying a pint of warm Tudor ale and chatting to the locals. Now, there’s living history! Indeed, I think it is fair to say that John Leland was much taken with Bewdley. He gushes about ‘the very fine bridge’ which had only just been rebuilt; the river busy with ‘flat-bottomed’ vessels bringing ‘all kinds of merchandise’ up and down the Severn – for Bewdley was an inland port, and thus, it had both status and wealth. While the town, he says, was ‘built on a hillside, so skillfully that no-one could wish for a better site’. The land rose up from the river, westwards, to an elevated position, such that anyone on that hill would have a view of nearly every house in the town. And then, as if we were not being sufficiently spoilt by Leland’s description of Bewdley, he states: ‘At sunrise, when the town is lit from the east, it glitters as if it were gold, for all its buildings are new’. Bellissimo! In understanding all this, we can perhaps begin to see why Bewdley became a key part of the itinerary of ‘The Council of the Marches’. West of the river, and the Tudor town of Bewdley, was Tickenhill House, situated ‘in a goodly Parke well wooded, on the very knappe of an Hill that the Towne standeth on’. The property had been long desired by some of the most powerful people in the land. The name, ‘Tickenhill’ comes from an old Saxon word, ‘ticken-hill’, which means ‘goat’s hill’ (or, perhaps ‘hill of the ponds’). Although it seems likely that even by Tudor times the goats were long gone, the name endured. The house was set in 2 acres of land and adjoined a fine park, which Burton’s History of Bewdley records had 3500 oak tress and 150 head of red deer by the end of the sixteenth century. Richard, Duke of York, father of Edward IV, probably stayed at Tickenhill in 1452. It had begun life as a medieval manor house built, according to Leland, by Richard, Duke of York (father of Edward IV) on land owned by the Mortimers, (who we also read about at Ludlow Castle) way back in the thirteenth century. Reported as ruined in 1304, then repaired in 1336, the first mention of a specific chamber in the house comes some 30 years later, in 1366, when we first hear of the chapel. However, by the late fifteenth century, Tickenhill had become a property of the Crown, having been inherited by Edward IV on his accession, (his grandmother was a Mortimer). At the time that John Leland visited Tickenhill, it had been extensively refurbished firstly by Edward IV; then by Henry VII in advance of Prince Arthur taking up residence there as head of the Council of the Marches. In fact, the buildings the antiquarian saw that day are confirmed as being, ‘in a maner totally erectyd by Kynge Henry the 7 for Prince Arthure’. The Family of Henry VII, showing the eldest son Arthur just behind the king. Arthur lived on and off at Tickenhill from the age of 7 years until his death in 1502. 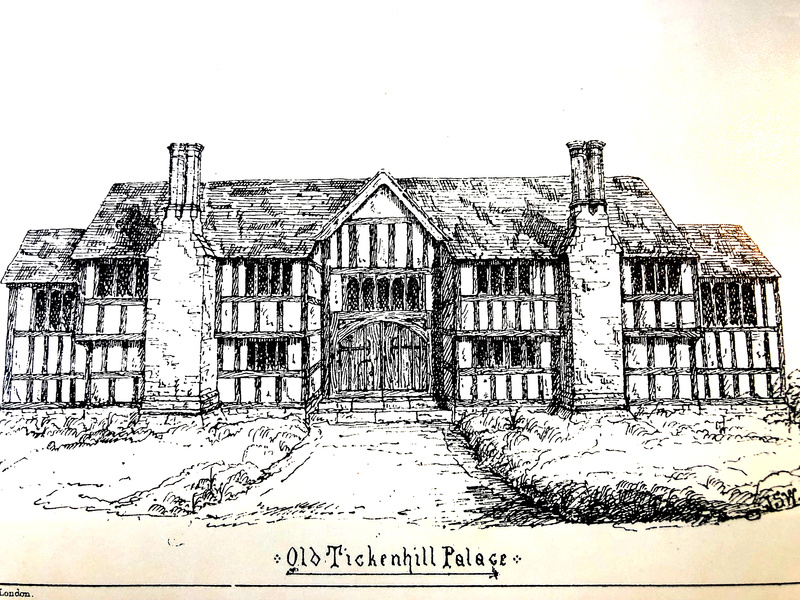 Although contemporary accounts note the cost of ‘greater stones’ being brought to Tickenhill House as part of a campaign of refurbishment, much of the manor was timber framed, and plastered. So, we can imagine timber-framed ranges, built on stone footings, and most probably arranged around a central courtyard. Records of work undertaken across the generations tell us a little more of the appearance of the house, as does an inventory taken at the end of the Civil War. From such documents, we know Tickenhill had a gatehouse, a ‘green court’, a chapel and ‘yard, garden and offices’. During the early reign of Edward IV a ‘long house’ (great hall), measuring 100ft long with ‘chambers above and below’ was also constructed on the south side of the existing buildings. To have a chamber above must have meant that the hall did not rise to full height, as one might expect and, in fact, there is a record of a gallery being above the hall, perhaps similar to the arrangement we see today at Hever Castle. The ‘chamber below’ probably referred to some kind of undercroft for storage. At the same time, accounts detail that new windows and doors were fitted and that stone tiles were brought on-site to construct the roof. It is postulated that the enlargement of Tickenhill House came in light of Edward’s declaration to establish a Council of the Marches, with his eldest son, Edward, as titular head, in 1473. As we have already heard, this precedent was followed some 20 years later when Henry VII sent his own heir, Prince Arthur, westwards from London to take up the same position circa 1493-4. Arthur was brought up at Ludlow Castle and its environs, including the comfortable manor of Tickenhill, from the age of 7. Documents suggest that the council tended to spend winters at Ludlow (about 15 miles to the west of Bewdley), and the summers at Tickenhill. So, it was at Tickenhill House, in the chapel, that Arthur, Prince of Wales was married by proxy to Katherine of Aragon on Whitsunday, 19 May 1499. They were both 13 years old at the time. Rymer’s Foedera, gives us a detailed account of the ceremony; at 9 a.m., following the first High Mass of the day, Prince Arthur met at the appointed time with the Spanish delegation. The princess’ ‘proctor’ was the Spanish orator, Roderic Gundeslavi de Puebla. The Bishop of Lichfield and Coventry, John Arundel, acted as Chancellor, and opened proceedings by declaring King Henry VII’s wish that the marriage should take place. De Puebla presented the princess’ commission attesting to the same, this included producing a document, signed by the princess herself. The document had Katherine’s seal attached by a green silk cord and was carried in a wooden box, which de Puebla had brought with him from Spain. The papal dispensation allowing the wedding was also produced. Having declared his own joy and wish to marry Katherine, Arthur took the proctor’s right hand, declaring that he received the Lady Katherine as his ‘true lawful and indubitable wife’; a gesture reciprocated by de Puebla. And so on a beautiful May day, when the gardens would have been in full bloom, the days long and the little town below glistening like gold, Prince Arthur finally married one of the most desirable princesses in Europe. However, they were still deemed too young to cohabit, and so it was not until a little over two years later, that the couple were finally married at St Paul’s Cathedral, in London. Before long, Arthur was bringing his bride back to his principality in the Marches, wending their way westwards towards Tickenhill, where they would spend their first Christmas together at the palace, presiding over their joint household. It must have been a happy time, Edward IV’s great hall bedecked with traditional Christmas decorations, the Yule Log burning in the grate, and the Lord of Misrule causing seasonal chaos amongst the many English and Spanish guests. A depiction of a great hall at Christmas time, including the bringing in of the festive Yule Log, by Robert Alexander Hillingford. The happy couple left for Ludlow Castle in early 1502, but of course, tragedy soon struck. Katherine and Arthur both fell ill in March, and Arthur died not long afterwards on 2 April. His body was ‘boielled and well seised, conveniently dressed with spices and other sweet stuff’. No lead coffin was required; instead it was placed in a chest and covered with a ‘black cloth with a white cross’. The slow and solemn funeral procession eventually left the castle on St Mark’s Day (25 April), heading towards Bewdley, and ultimately on to Worcester, where Arthur’s body would be entombed. At the time, the weather was atrocious: a contemporary manuscript describes ‘the foulist could windy and rayney day’ on which the journey took place and the difficulty of bringing the coffin along the heavy roads, ‘in some places fayne to take oxen to drawe the chare so ill was the way’. The special wagon carrying the young prince’s body was upholstered in black and drawn by six horses, also caparisoned in black. Once at Tickenhill House, Arthur’s body was placed in the quire of chapel, with lighted tapers put about it, keeping vigil both day and night. A dirge was sung that day, followed by a Requiem Mass the following morning, before the coffin containing Arthur’s body was transported down into the town, there to be loaded on to a boat and conveyed downstream to the City of Worcester. After Arthur’s death, it is likely that Tickenhill fell into a state of some disrepair. No household was being maintained there, and records show substantial works were undertaken in advance of the arrival of Princess Mary in 1526. These works took 18 weeks to complete and cost £355 (quite a colossal sum at the time). As part of these accounts, we hear something of various named chambers at Tickenhill, including: ‘My Lady’s Own Chamber [possibly Katherine of Aragon’s old room, as Mary was not yet in residence? ]; ‘My Lord President’s Chamber’ and ‘The Prince’s Chamber’ [clearly part of Arthur’s old suite of rooms]. It is certainly possible that there were fresh additions to the house at this time. Portrait of Mary I of England after the face pattern by Anthonis Mor. Historians record Mary’s household as being ‘elaborate’, based on the extensive list of those appointed to attend upon her. The Letters and Papers of Henry VIII record that certain items were delivered out of her wardrobe for her attendants including, ‘damask, velvet and cloth’, while ‘copes, altar vestments, cushions and mass books’ were sent for from London to furnish the very same chapel in which her long-dead uncle had once been married, and in which he had subsequently lain in-state. It must have been a very strange experience for the 9-year-old, so far from her mother, and yet through time, connected to probably one of the most joyful times in Katherine’s life; the echoes of a long-past Christmas in which two young teenagers took their first step in fulfilling the dynastic aspirations of their parents. Perhaps at the time, as Mary occupied her mother’s old chambers, she was aware of the machinations afoot for her own potential wedding to Francis I, or his second son, Henri, Duc D’orleans. The circle of life continued to turn! After the Restoration of the Monarchy, following the Civil War in England, ‘The Council of the Marches’ was abolished and Tickenhill rapidly fell into decline. However, parts of the building did survive. Thanks to an account of another antiquarian, who I have ‘met’ before on my travels, a ‘Dr Stukeley’, we have both an account, and the only known sketch, of the palace (see ‘Featured Image’ above). He visited in 1712, when the part of the house shown in the sketch was still standing. It is described as having a gatehouse, with two dwellings on either side. It formed part of the original east range, which stood on the brow of the hill, overlooking the town. There was also another building on the north side, attached to the aforementioned range, thus creating an ‘L’ shaped configuration. The ‘first room entered’ was described as the hall – but it was said that this was, in fact, the old chapel, where marriages were being solemnised as late as 1701. If this is true, then we have been left with a sketch of the part of the building that is perhaps more important historically than any other. In 1735, what remained of Tickenhill House was partially restored, although the Tudor house was now given a Georgian facade. From a booklet published in 1946, there is confirmation that within the hall there was still work to be seen from the time of Henry VII, including panelling also of ‘an early type’. How wonderful though that during repairs to some of the wainscot panelling in the house, a lady’s shoe of the Tudor period was found behind the panels – it’s fabulous Tudor history captured in one small item! Extensive cellars also remain from the original building. Tickenhill was no doubt a beautiful palace, more homely and comfortable than the austere Ludlow Castle, the other key base of the Council of the Marches. Being away from the press of a town, in clean air and surrounded by pleasant gardens and a park, it must have made for a very enjoyable and healthy summer retreat. It was the site on which important Tudor history unfolded, and yet, now largely lost, it has become somewhat separated from the historic events that took place there. So, let’s celebrate the palace of Tickenhall and its place in the incredible story of the Tudors! The History of the King’s Works, Vol 4 Part II, by Colvin.